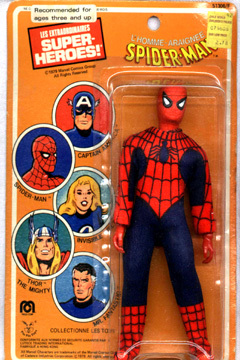 Spider-Man made his debut in the fall of 1973, the Marvel characters being hastily acquired by Mego after the DC only launch of the first four WGSH. This second wave of characters included Tarzan and Captain America. Spider-man is easily the best selling WGSH of all time, only his Marvel cohort the Hulk, could give him a run for his money in terms of popularity. 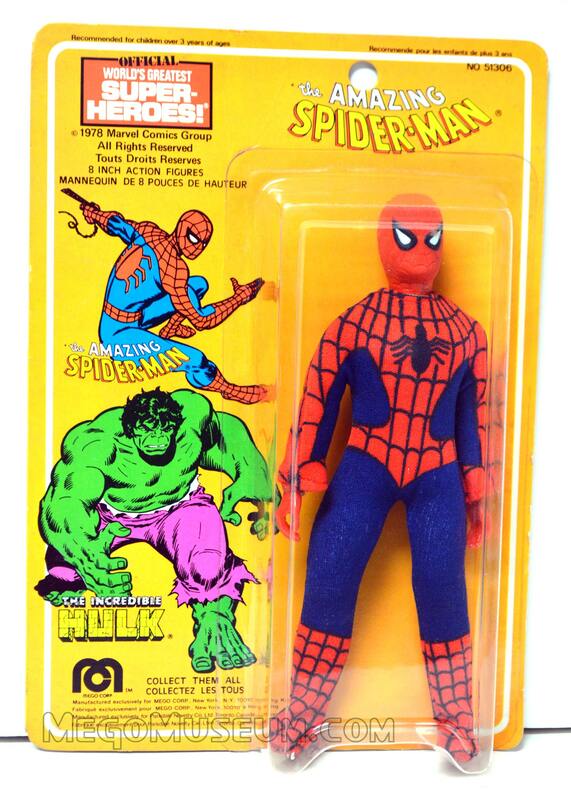 Spidey was produced from 1973 to 1982 and hold a rare distinction of being the only Marvel Hero to be in every Mego Superhero line produced. 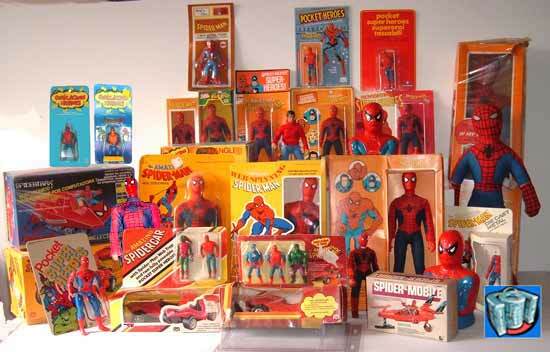 Just a tiny sampling of the Spiderman merchandise produced by Mego. 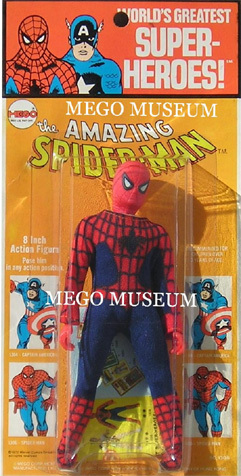 A number of Spider-man playsets and vehicles were produced in other formats by Mego. 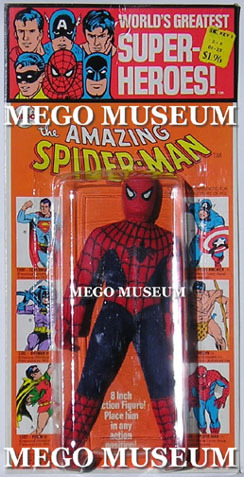 Of particular note would be the Super Softies , Bend N Flex and Comic Action Heroes but if it was a Superhero item made by Mego, Spider-Man was there. 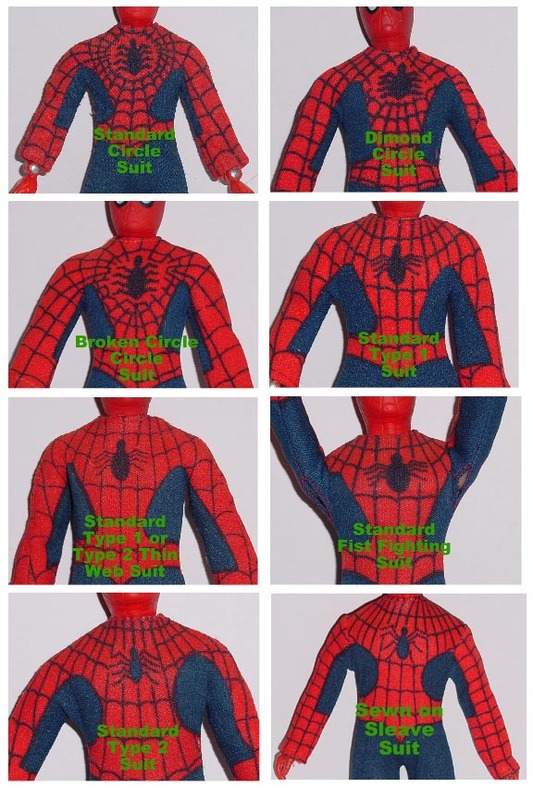 Because of his longevity within the line and the fact that Mego switched production facilities frequently, there are a great number of running changes and variations to Mego Spider-man, below is a chart showing just a few (Thanks to John P for his fantastic research). 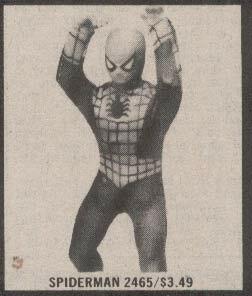 One of the more desirable variations are the “Circle Suit” which was an early attempt at silk screening the Spidey Logo. Pictured on the left is a shot of an early Spider-Man prototype and on the right an early Circle Suit Spidey standing next to Peter Parker. Marvel wasn’t happy with the circle suits and they were quickly corrected. Another good example of costume variations is the hourglass and wide cut on the type 2 Spider-man figures. If you tried to collect the variants on this long running figure, it would be a hobby in itself. 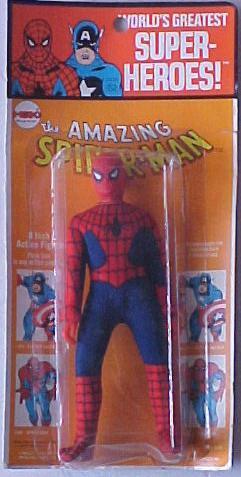 Boxed Spider-man figures are more difficult to find than their carded counterparts, here is the oft-mentioned “Electric Company” Spidey which was a later box used to promote the web slinger’s appearances on the PBS educational series. Close up of the Back of the CS Spider-Man box. 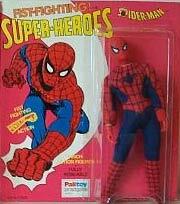 Spider-man was never released in a solid box, he did receive a number of window box variations. Courtesy of Tom, we have a line up of the many variances in box packaging. 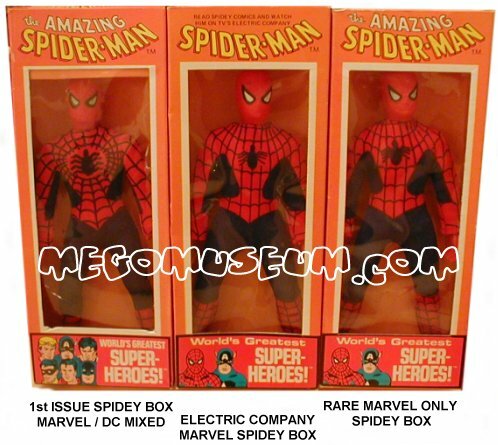 From the left we have the 1973 first issue box, the revised Marvel Only Electric Company box and the hard to find non EC version of that box. 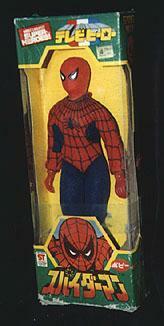 On the left is an early Spider-Man Kresge card, examples of Circle Suit Spider-man on Kresge cards exist as well. On the right is a revised “Marvel Only” Kresge card. 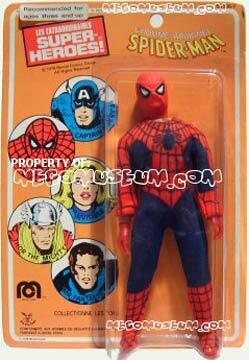 Above is another variant, Mego started at one point to include catalogs in Kresge cards and window boxes. 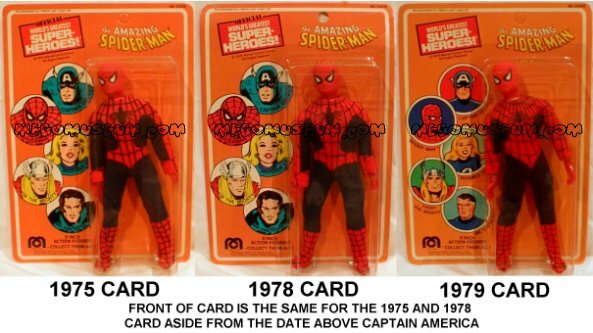 Tom provides the three US carded Spiderman figures, note that the 1975 and 1978 card feature identical artwork save for the date. 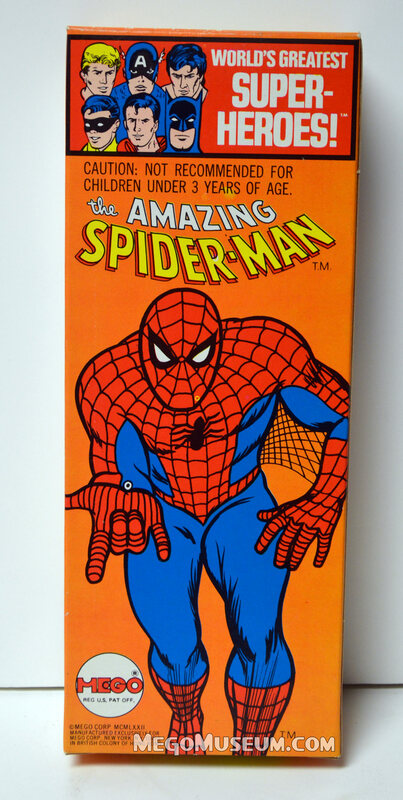 Spider-man is less common on a US card. 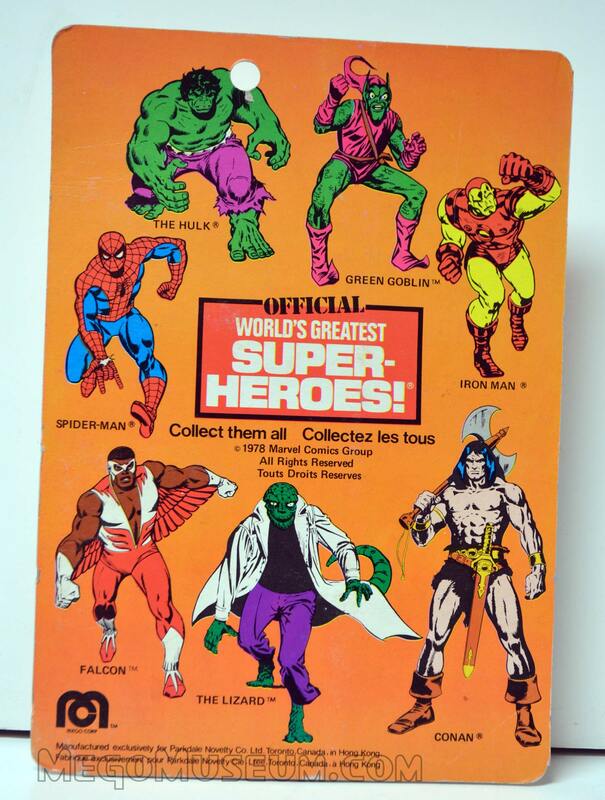 Despite the front artwork not changing between the two figures, Marvel changed the Hulk style guide often, no doubt to the characters TV popularity. 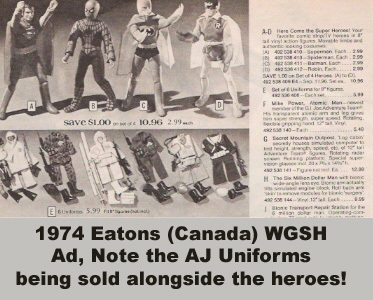 Palitoy of the UK distributed their Mego characters on green individually produced cards under the “Super-Heroes” brand. Marvel characters such as Spider-Man are difficult to find. 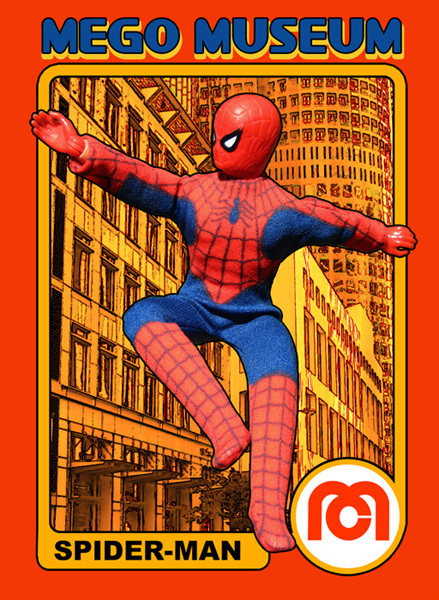 Spiderman was a part of the Palitoy Fist Fighting Heroes line in the UK, the die cut cards are very hard to find in pristine condition. 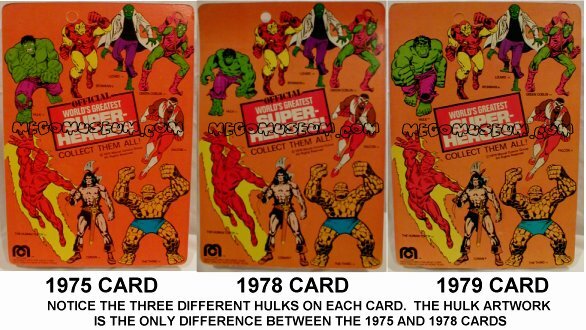 Parkdale Novelty introduced a variant in 1979 when they released cards with only Spider-Man and the Incredible Hulk on the front. 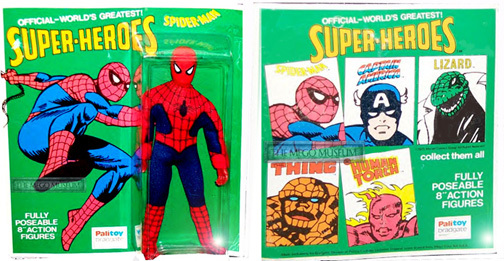 This assortment only included those two heroes and as the editor, I can honestly remember seeing full end caps of these at shops like “Dominion Playworld” and being rather disappointed that no other Marvel heroes were available. This beautiful example comes courtesy of our friends at Heroes West Coast. Above are two examples of the Pin Pin of France. 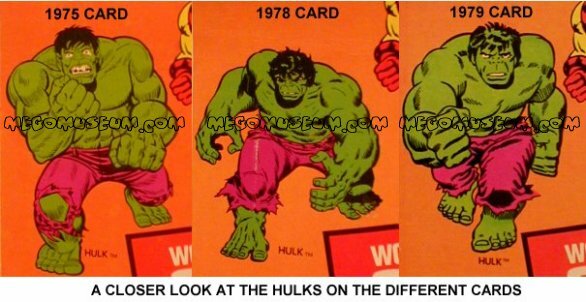 Figures on these cards were closed out in the US in the early eighties and are often mistaken for Canadian cards. On the left is the very common 1979 pin pin Spiderman (courtesy of Troy) and on the right is the hard to find 1978 Pin PIn Spiderman (courtesy of Tom).